Italy’s hard-line interior minister has refused to let a rescue boat with 224 migrants on board dock in Italy, saying those on board ‘will only see Italy on a postcard’. Matteo Salvini’s latest move to clamp down on arrivals from the Mediterranean comes a week after he turned away another foreign ship, the Aquarius, which was carrying 630 migrants and had to reroute to Spain. 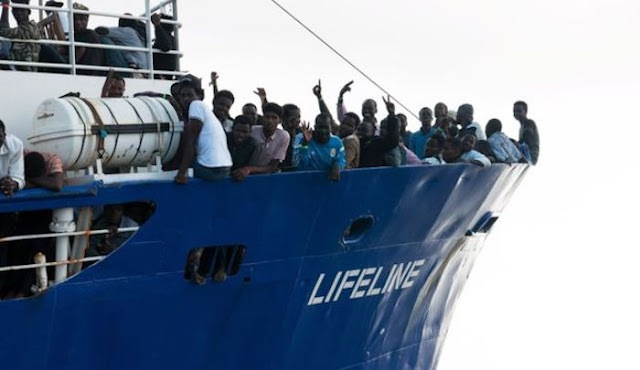 Salvini said the latest ship, operated by German aid group Mission Lifeline, had loaded the migrants in Libyan waters against the instructions of Italy’s coast guard. Mission Lifeline denied Salvini’s claims, saying it conducted the rescue in international waters and asked for a safe port, which had not been assigned. The Aquarius, operated by SOS Mediterranee and Doctors Without Borders, took the migrants to Spain, travelling an additional 932 miles, after Italy and Malta refused to let them land.